The holidays are time for giving. That means you could be on the receiving end of some new stuff. There is nothing wrong with that unless you don’t have any room in your home. Even a bunch of little things can add to a home that is already overflowing with clutter. You can do your best to rally the family around cleaning up the clutter but sometimes it’s a losing battle. 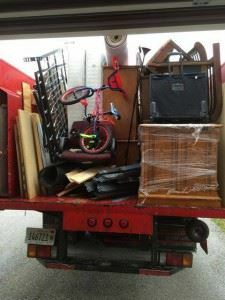 This is why you should consider a “clean sweep” decluttering with Junk King Cleveland. Once the crew is done at your house, you’ll have plenty of room for your new stuff! It’s fair to say that you probably have at least half a truckload of things that you could get rid of from your home. Between your closets, garage, basement and attic there are a lot of things that have been tucked away that aren’t being used. The question then becomes will those things ever be used again? If that answer is “no,” then why are you holding onto that stuff? Thanks to Junk King Cleveland, you don’t have to any longer. You might think that the only reason to hire Junk King Cleveland is to get rid of big things like a sofa or refrigerator. Although they certainly can handle those types of items, you can also load up the truck with a bunch of little things like boxes of old clothes or household goods. You can also toss out toys that no one is playing with, books that aren’t being read, sporting equipment that isn’t being used or electronic gear that has been replaced. That could certainly fill up a lot of space on the Junk King truck! Now just think of how much more room you’ll have in your home once all that clutter is gone. You might feel that it is a waste to get rid of all those items even if you’re not using them. However, when you hire Junk King Cleveland you can rest assure that nothing will go to waste. Junk King Cleveland will happily drop off any of your items that are usable to one of the many local charities. That is a great thing to happen at this time of year! The only real way to make room in your home is to clear out the clutter and the best way to handle that is to bring in Junk King Cleveland. This entry was posted in Clear The Clutter and tagged Junk King, junk removal, room, stuff on December 26, 2016 by Ivan Baker. Last updated August 8, 2017 .